Confusion about passport requirements for children is quite a common occurrence, I will try to briefly explain when a child needs a passport and when they don’t. The specifics for obtaining child passports with and without the consent of the other parent, I will save for another time. Regulations and required documentation for travel outside the United States have been constantly reviewed and revised since 2001. Those planning such a trip are well advised to have the most up to date information and should begin the process of securing needed documents as early in the process as possible. In many cases, there are different requirements for adults and children under the age of 16. The Intelligence Reform and Terrorism Prevention Act of 2004, tasked the U.S. State Department and the Department of Homeland Security with requiring all individuals entering the United States to present a valid passport or other pre-approved document. In order to better protect the borders, yet make travel into the U.S. from its neighbors to the north and south, as well as Bermuda and the Caribbean, as streamlined as possible, the two U.S. departments worked in conjunction to come up with the most expedient way to pass visitors quickly through border checkpoints. The Western Hemisphere Travel Initiative (WHTI) is a plan that deals in part with U.S. citizens entering the United States from Canada, Mexico, Bermuda and the Caribbean or points within the Western Hemisphere. In early 2007, the WHTI requirements were implemented for air travel. A valid passport is now required for minor children entering the country by air. Consular Report of Birth Abroad – Parents who are U.S. citizens and give birth abroad should immediately contact a U.S. Embassy or Consulate to have this report issued. Replacements or copies can be requested at any time. 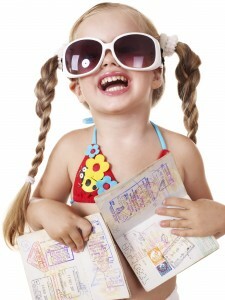 It is recommended that the parents apply for a child’s passport at the same time. Passport card – This is a less expensive option for those needing passport type documentation for travel to areas covered under the WHTI. For minor children, the passport card is valid for five years. When traveling by land, parents and guardians should occupy the same vehicle when arriving at the border. FACT: Children travelling by car or boat to Canada, Mexico, Bermuda, and various Caribbean countries do NOT actually need a passport if they are under 16 and not travelling by airplane. Permission for the child named in letter to travel to final destination with accompanying adult. The letter should be notarized. For all overseas travel by air, children under the age of 16 must always have a U.S. passport which is valid for five years from the date of issue. Children under 16 can travel to Mexico, Canada, Bermuda, Bahamas and other Caribbean countries by boat, train, or car without a passport. 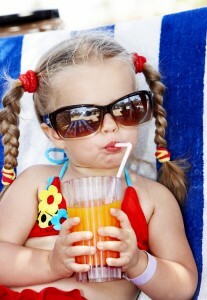 Passports for minors must be applied for in person with the child and both parents present. If both parents cannot be present, a notarized parental consent form must be completed. Applications must be made at a passport agency or authorized passport acceptance facility. In cases where written permission from the non-custodial parent cannot be obtained, a statement of exigent/special family circumstances must be submitted.